Bizarre ethos, synthesizers, weird gadgets obtained via eBay, girls, UFOs, experimental process. 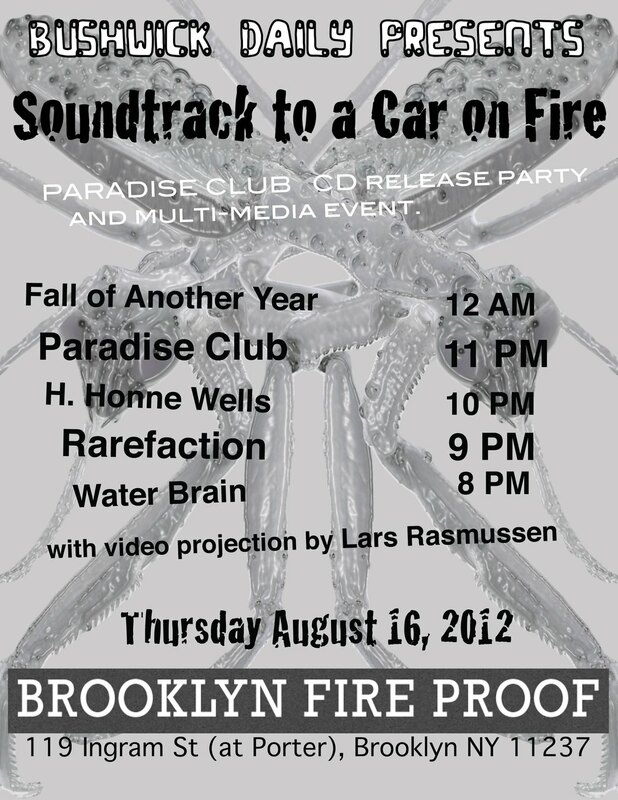 Electronic band Paradise Club is celebrating their freshly released album in all their Bushwick weirdness this Thursday, August 16 at 8pm at Brooklyn Fire Proof. The night named after their album Soundtrack to a Car on Fire, will feature 4 other bands of a similar experimental mindset (Water Brain, Rarefaction, H.Honne Wells and Fall of Another Year). How did it all begin? When did you realize you're a band, not just two guys making sounds? Eric: We have been making music together and with other people for a number of years now. There was just a point where it was just us two left and we decided to let machines do the work that would have been done by other members. This really freed things up and allowed us to engage in the kind of experimentation and discovery that we had always wanted to. This is when Paradise Club really came into being in the springtime of 2011. Kiowa: It felt like we were both struggling to incorporate more chaotic elements and performance art practices into the music we were making, and the decision to just start from scratch with a new name, line-up, and instrumentation really opened up the possibilities for a new sound. There can be a lot of clichés associated with branding a collaboration as a “band”—mostly associated with the celebritization of musical groups brought on by rock and pop, and that’s not where we wanted to go with this project. But I think we’ve sort of achieved a good balance between what essentially makes a “band”—which is people making music together, with trying to create something more bizarre and unique by bringing in the elements of more art based practices; such as performative actions, visual art, weird manifestos, etc…, while still incorporating a band ethos into the music. This helps to connect the sounds to people as somewhat structured songs with ideas, motifs, and emotions embedded in. I like to think of bands as little mini-cults—a group of people who believe in certain ideas spend a concentrated amount of time building on said ideas and create different ways to express them, then the group start preaching these ideas to the people in the hopes that they’ll believe in them to. The interaction of ideas and energy grow into a collective unconscious, channeled through sounds, and then you have something. Eric: 2 synthesizers, 2 vocalists, 1 guitar, 1 saxophone. Kiowa: This is like trying to describe a mugger for a police sketch or something…so far I think we’ve kind of hidden behind naming the music and musicians that have influenced us rather than trying to put the actual sounds into words. I’d like to think of our music achieving a visceral effect similar to the distortion of sound when under water, or the audio physicality of a good nitrous oxide trip. Eric a while back just started calling it “Soft Skull”, I think it is good to have a new way to describe something new. We are a Bushwick band. These streets with their once desolate warehouse and factory canyons and its whore lined streets are our inspiration. 12 years ago burning cars were as common as overpriced cafes are now. “Soundtrack to a Car on Fire” is a fairy tale of an apocalypse long past. What is the favorite music instrument/gadget you are using? Eric: I don’t really have a favorite. I have the most experience with guitar but it really only plays a minor role at the moment. The Minimoog is really the backbone of our sound on this release. It is the starting point of everything we do. I am hoping to incorporate more instruments in the future. Kiowa: For me it’s the saxophone. I find that the tone of the instrument can both blend in with the atonal nuances as well as punctuate the more chaotic noises of the music in interesting ways. Plus I enjoy the physical challenge of the instrument; particularly its connection to human breath. There reaches a point with these songs that I feel like I’m going to pass out, and that’s when I know that we are playing at our best. Can you describe your 1st album? What influenced its creation the most? Kiowa: The album is sort of a layer cake of different noises and atonal drones stacked and blended together to make something akin to a song. Sort of like looking at a cartoon rendition of the earth’s soil: you have the inner and outer cores, the mantle and the crust, with some dinosaur fossils, oil, and dirt; all crushed and fused together—now just think of this diagram as an audio experience...Lyrically, we tend to write songs about what we know: girls, political strife, and UFO’s. There wasn’t any one particular thing that influenced the making of the album, beyond just coming to a point where we had been playing these songs awhile, and the order of the songs fit, so it was like “when are we going to record this stuff?” Plus we were able to work with our friend and master sound guru, Lou Sherman, so the pieces just fell into place. You are very close to visual arts. In fact Eric, you are a painter as well. Do you see the connection between your music and your art? Eric: No matter what I am making it is always the same approach. Musical sound is just another material to work with. What I like about working with musical sound is it exists in time, space, and can even be felt, yet it remains invisible. I think of our songs more as places that can be visited rater that something to just listen to. I like the collaboration of music rather than just toiling away alone in an art studio. Kiowa: Looking at music and being in a band as more of an artistic project, similar to creating a painting or sculpture but with sounds, seemed like a better outlook to produce the music that we were trying to create. Why the name "Soundtrack to a Car on Fire"
Eric: We are a Bushwick band. These streets with their once desolate warehouses and factory canyons and its whore-lined streets are our inspiration. 12 years ago burning cars were as common as overpriced cafes are now. “Soundtrack to a Car on Fire” is a fairy tale of an apocalypse long past. Kiowa: When a car burns it takes some time as the metal slowly melts and its flammable guts ignite. In my mind’s eye I can picture the act of a car (or any object for that matter) burning with a certain rhythm pattern; with the sight of the flames flickering and the thing itself slowly smoldering… creating a sort of visual opera. Our music has that kind of beat to it—long intervals of entropic destruction leading to a dead simmer and stillness—leaving only junk and ash and fumes for someone to sweep up.